You’re probably feeling really overwhelmed and not sure where to start when trying to stock your pantry for the first time. This is especially true when you are building a pantry on a budget! While this article is geared towards people who are stocking their pantry for the first time, the tips are still relevant to those who are restocking their pantry again, such as after moving, or after eating down your pantry to the bare bones. For the purpose of this article, I’m only going to be talking about dry goods you find in your pantry/cupboards. Perishable foods, like vegetables, fruit, dairy, and meat aren’t included so make sure you leave room in your budget for those foods too! 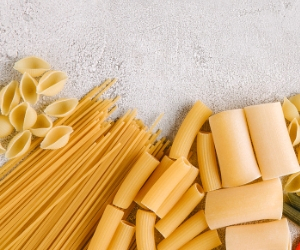 Building your pantry, even for the first time, will help you save money in the long run. It costs a bit upfront, but it’s worth it! Even just one takeout meal due to not having food on hand could end up costing you easily as much as one or more days worth of food bought at the grocery store and cooked at home. I’m not saying never eat out, but avoiding those unplanned takeout meals that happen just because there was nothing to eat at home can go a long way! When you’re starting from scratch with an empty pantry, filling it up can be a huge hit to your wallet! Even buying inexpensive foods like oil, vinegar, beans, and rice can add up when you have to buy them all at once! You could easily spend hundreds of dollars stocking your pantry. We don’t all have several hundred dollars to spend on food in one go! I acknowledge that some may not even have an extra $25 to spend on non-perishables at once. Do what you can with what you have. You can slowly build up your pantry with even a few extra dollars each week buying one or two extra items or getting the bigger package of a staple item. See where you can get food for free. I recommend looking into these three options for getting free food first. Obviously whatever you get for free, you won’t need to buy so it’s best to do this first. This page may contain affiliate links which means I earn a commission if you use them, at no extra cost to you. I only recommend what I use and trust. Ask friends and family if they have anything they don’t want. I know a few times I’ve helped people move and they were so happy to give me some of their food rather than moving it. Also, I’m sure people have food they bought, tried, but don’t like enough to eat. Ask them if there is anything they would share. For example, they might share a few cups of rice, flour, or a jar of oil or vinegar. Even just these small amounts would help the budget since you won’t have to invest in a new package right away. Check out trading sites such as BUNZ. On BUNZ, you can trade items with other people. Basically you could trade some items you don’t want for items other people don’t want! Sometimes that includes food! Sign up HERE! Consider getting a basket from the food bank. Food banks are there to help people who aren’t able to afford food. If you have an empty pantry and don’t have enough money to even get the pantry basics, then you may be eligible to get a food bank hamper. It’s totally ok to admit you need help and ask for it. Shop sales. What’s on sale the week you’re shopping? Is your favorite item on 50% off? You could get double what you normally would for the same price! You could either stock up on that item, or use the savings from that item to buy something else. Meal plan. I recommend planning your meals after you see what’s on sale so you can make the best use of your budget. Plan meals that use low cost, filling staples. Use cash back apps to save money on what you were already going to buy. Remember, coupons only save you money if you were already planning on buying the item! Don’t get something just because it’s a good deal. I use and love Checkout 51 and Caddle. Get $5 for signing up to Checkout 51, HERE, and $1 for signing up for Caddle, HERE. Get the bare bones. By this I mean only get one grain, oil, vinegar, sauce, etc. to start off with. 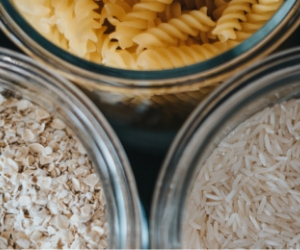 If you’re on a budget, you may not be able to stock up on rice, pasta, and flour at the same time. Also, if you spent all your budget on those items, you don’t really have any meals out of it! I recommend getting one item from each of these categories and making sure they go together! If you still have money left over, then buy other options. Consider skipping the jumbo package. This tip goes against most budgeting advice because usually the larger packages are a better price per weight than smaller packages. When you’re building a pantry on a budget for the first time though, it doesn’t help you much to have 25 pounds of lentils or oatmeal if you don’t have any other ingredients to use to make it into a meal! After the first few weeks when your pantry has some variety of staples and seasonings, THEN begin stocking up on your pantry items in larger quantities. Consider buying the smallest packages. This goes along with the previous tip. This is especially good advice for those stocking a pantry for the first time, who have literally never had their own pantry. You probably don’t know your preferred brands or your cooking style yet. Even though buying smaller packages isn’t usually the most frugal choice over the long run, in the short term, it can help you stay within your budget. It can help you avoid buying something you don’t even like, or won’t use, which is a waste of money! Avoid buying non-essentials. 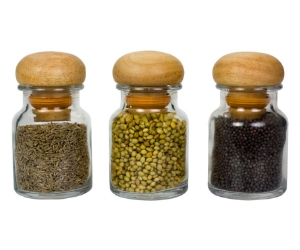 Non-essential pantry items are things like snack foods and desserts, fancy sauces, or seasonings, etc. I can’t say exactly what is non-essential to you, but generally aim to get the pantry basics first, then get the extras if there is room in your budget. Get inexpensive pantry items. 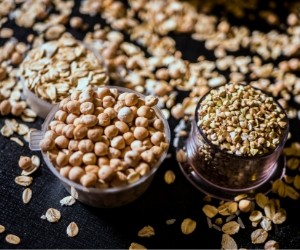 The most inexpensive staples may be different where you live, but generally rice, flour, oats, dried lentils, dried beans, and canned tomatoes are quite affordable. Take into account what you’re going to eat the first few weeks. It doesn’t help you stock your pantry if you only get enough to eat for the week. But it’s totally understandable if that’s all you can afford at first. Try to get at least a few items that will carry into the next week or longer. If you’re able to get more than what you will eat each week, your pantry stockpile will grow. Depending on how tight your budget is, you will be using a bare bones pantry for at least a few weeks. Set aside some money from each paycheck to get a few more pantry staples each week in addition to your weekly food. Over a few months, your pantry will be well stocked and you won’t have broke the budget! See my list of frugal minimalist pantry staples for an idea of what to stock in your pantry. I hope you found some tips to help you stock your pantry for the first time. Building a pantry on a budget isn’t the easiest, but with a bit of planning and creativity it’s totally possible! Sign up for my 3-day mini pantry purge challenge!